If the social does not exist as a special domain but, in Bruno Latour’s words, as ‘a peculiar movement of re-association and reassembling’, what implications does this have for how ‘the cultural’ might best be conceived? What new ways of thinking the relations between culture, the economy and the social might be developed by pursuing such lines of inquiry? And what are the implications for the relations between culture and politics? 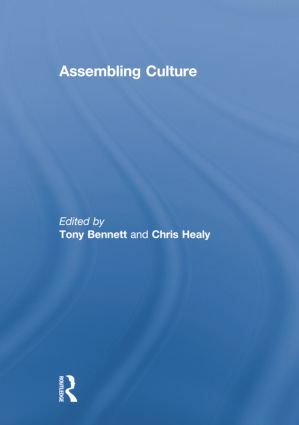 Contributors draw on a range of theoretical perspectives, including those associated with Deleuze and Guattari, Foucault, Law and Haraway, in order to focus on the roles of different forms of expertise and knowledge in producing cultural assemblages. What expertise is necessary to produce indigenous citizens? How does craniometry assemble the head? What kinds of knowledge were required to create markets for life insurance? These and other questions are pursued in this collection through a challenging array of papers concerned with cultural assemblages as diverse as brands and populations, bottled water and mobile television. Chris Healy, Associate Professor in Cultural Studies, The University of Melbourne.